All of the professionals at Strait Smiles Family and Cosmetic Dentistry maintain the highest levels of accreditation and pursue ongoing education to stay ahead of the latest trends in dentistry. 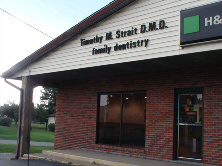 Dr. Timothy M. Strait’s team gets to know their patients – their medical histories, their families, and their dental goals. As they build a bond of friendship and trust, it helps them serve your dental needs more effectively.